It was with great pleasure we received an email early in the year from Gerd saying he was returning to J6! We got his license sorted out for him. 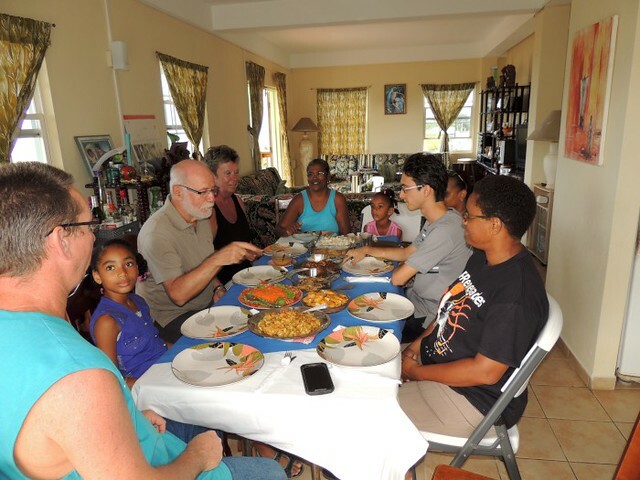 And on 11 May he was back in Gros Islet at Bay Guest House! The perfect place for a visiting ham! He ven had the same room again! Of course we met up with him and Erika (his xyl) the very next day, and many times during his 12 days here. He came up to the house for a nice lunch with Cyril (j66sj) and Yasmin (J66yaz) and the yota (Youngsters on the air – j62yota) Anniqye and Journeii. Ian was unable to attend and was missed. We had a great time lots of laughs and fun! We did plan to do a beach session the Saturday, but the WX was seriously not with us, it poured cats and dogs. So instead we ended up going to our daughters place and did a BBQ there, and had a great evening there instead.Time was truly short, twelve days go by in a flash. Good news is Gerd has a J68 call now so he has to return eh! hahaha I am sure we will see him soon again!